Two Bengal tigers, a leopard, and a lion at a Massachusetts zoo dined on prime cuts of meat last Friday night after the power went out. 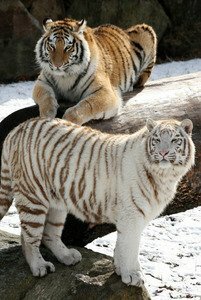 Bengal tigers Kya and Taj were fed prime cuts of meat from a Capital Grille restaurant. A transformer fire caused around 21,000 people in Boston to lose power last Tuesday, including a restaurant called the Capital Grille. With no refrigeration, the franchise decided to donate 2,500 pounds of prime cuts of meat to Mendon’s Southwick’s Zoo, as the meat was deemed no longer fit for human consumption (the meat had been stored in a refrigerated truck). The meat was estimated to be worth $20,000 to the zoo. The cats ate well on Thursday, and leftovers should last for several weeks. According to the Capital’s dinner menu, a 10-ounce Fillet Mignon costs $41.